Piura is a fascinating department. It is the land of romantic dance, huge deserts, beautiful women, exotic beaches, "dancing horse" breeding, and of the seco de chavelo, a pork, rice and plantain dish. Piurans welcome visitors with open arms. The average temperature above 25 degrees Celsius might influence this warm demeanor. The sun toasts the coast, but promises refreshment in the bracing Pacific. Although the department is mainly desert, extensive irrigation and infrastructure have turned the region into one of the main agricultural producers of Peru. 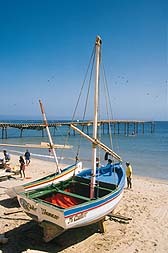 The capital, also named Piura, has a growing, profitable fishing industry. It is an important urban centre which receives petrol from the jungle via the north Peruvian pipeline. With more than 300,000 inhabitants, Piura is the second most populated city of the country, yet its large, shady Plaza de Armas still has the feel of a small, Spanish town. Indeed, Piura is Peru's oldest colonial city, founded in 1532 by Francisco Pizarro. The centre still has some Spanish architecture, but most structures were destroyed by an earthquake in 1912. The conqueror Francisco Pizarro founded Piura, though not at its current site, but at Tangara, near the Chira river. All of the area was considered rich in resources, especially among pirates such as Cavendish, an Englishman who sacked the town in 1587. 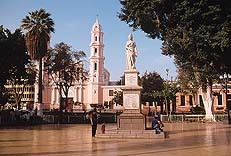 Today, Piura's Plaza de Armas is wide, placid and watched over by a statue of liberty. In one corner stands the Cathedral built in the colonial style with an imposing belfry. The structure dates from 1588 and contains near its high altar the image of Saint Dimas, the good thief, who along with Gestas was crucified next to Jesus Christ. Saint Dimas is one of the most worshipped images in the region. In one of the naves visitors can see a beautiful portrait of San Martin de Porres by Ignacio Merino, the work described by the famous Peruvian writer Aurelio Miro Quesada in one of his books. Piura is a land of great men, intellectuals, artists and heroes: Carlos Augusto Salaverry, a romantic poet of the last century; and Merino, one of the great Peruvian classical masters. Merino studied and eventually died in Paris, leaving behind a collection of extraordinary works. The River Piura splits the city in two: on one side the old business quarter, on the other, newer suburbs such as Castilla (formerly called Tacalá), and around them the ubiquitous shantytowns. Three rivers flow through the Department: the Piura, the Huancabamba and the Chira, all of which are transformed into raging torrents during the rainy season. Now they are a source of life: the strong San Lorenzo Dam contains the Quiroz river, a tributary of the Piura. To harness the overflow of the Chira River is a huge reservoir capable of holding a billion cubic liters of water. Many other dams serve to irrigate farmland on the Piuran coast. Water from the Huancabamba in the highlands will drive a hydroelectric station providing the region with power. It will also be used to irrigate fertile cropland that would otherwise be parched. Only six kilometers from Piura we find the village of Simbilá, land of craftsmen and potters who work with baked clay and whose bowls are used in the preparation of the delicious chicha, the fermented corn drink of not only the region, but also of the whole country. The friendly people of Simbilá are used to showing how their big pots are modeled by means of the "palette technique," which has survived in the northern part of the country thanks to tradition handed down by the ancient Vicus civilization. Although this culture developed between 400 and 600 B.C., some pieces date to 1500 B.C., and are believed to be the first of what became quite elaborate ceramics made by the Vicus, Piura, and Tallan tribes. The market for the pottery of Simbilá well exceeds that in Peru; Japan is one of the biggest international importers. Ceramics from Chulucanas, southeast of Piura, are also highly appreciated. The people represented in these objetcs d'art are often rotund, their smooth, robust bellies serving as plant pots, urns or adornments. The craftsmen beat the clay with a palette, a ping-pong paddle look-alike that gives the pieces form. Piura is known for its pristine white beaches and summer sun - which is remedial after seven months of gray winter skies in Lima. The most famous beaches are in Mancora and Cabo Blanco, the meeting point of the warm and cool currents that can dramatically change the climate throughout the continent. Cabo Blanco is world-famous for its white marlin, the main character in Ernest Hemingway's "The Old Man And The Sea." Hemingway frequented the Fishing Club of this area, which has just been renovated and reopened, with deep sea excursions and well-appointed hotel rooms. 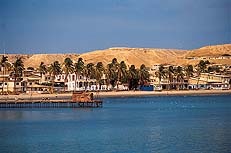 Near the port of Piura we find the Yacila and Cangrejos beaches and the pretty marina of Colán. All of them offer deep sea and seaside fishing and first class hotels. Less costly and quaint accommodations are also available in the town of Máncora, an hour and a half away from the airport of Talara or Tumbes by car, a straight shot north or south along the Pan American Highway, respectively. Colán, a beach with golden sands and sun to match, is only an hour's drive from the city of Piura. Lodging and local restaurants with excellent ocean views are easy to find. The sunsets are colour parties with an amazing mixture of reds and yellows that words can not do justice. Talara is a very important province of Piura. It was here that oil was first found on Peruvian soil. Soon after, a well-known multinational corporation bought the drilling rights, operating the field until it was expropriated in the 1970s. Oil companies have returned to Piura, this time drilling offshore on the continental shelf. Piura is responsible for 33% of Peru's petroleum output. Sechura is the name of both a desert and town located 54 kilometres southwest of Piura. Its ecological attractions range from massive dunes to humedales, a sort of mist that forms temporary lagoons in Lower Piura. An unforgettable excursion is a visit to the Ramón and Napique lakes and the swamps in San Pedro. These are all near the town of Sechura, where a notorious mix of flora and fauna contributes to the marine ecological balance. This region also forms its own reserve of migratory birds that travel from Cabo de Hornos in Chile to Alaska. This is a place which awaits official protection like so many unprotected areas of this country. 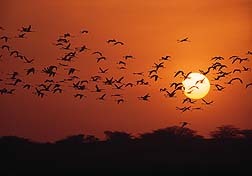 A little bit farther north and next to the China river, near Talara, is the 75 hectare national park Cerros de Amotape. It can be visited by contacting a travel agency. In Huancabamba, 284 kilometers from Piura, we find 14 lakes that form Las Huaringas. The largest of these is the Simbe, but La Negra is still the favorite of the "chamanes," medicine men of the region, for its healing properties. Huancabamba is treated with reverence by the majority of Piurans. Other soothing waters are found in Ayabaca, such as the Inca's Lagoon. If you doubt the effect of these mystical practices, tell the numerous business executives who travel to the region for advice and treatment. For a change from the colonial style of Piura City's Cathedral, visit Sechura's main church. Its peculiar architecture is worth seeing. The oft-visited cemeteries of Sechura, which are as large as the city, are usually dotted with women in black, making for a maudlin but interesting cultural view. In Catacaos, just 12 kilometres south of the capital city, one finds delicate wool weavings and finely filigreed gold and silver. A stroll along Comercio Street treats the visitor to all of the exquisite crafts of Piura. The artisans are usually eager to explain how they create these fine pieces. Near Catacaos is the archaeological complex of Narihuala, probably the main political and administrative center of the Tallan nation. It was conquered by the Chimú culture (ca. 1100) just before taking part of the Inca's domain. Its people were quite skilled in ceramics made with the palette technique and metallurgy. For those interested in arhaeology, 55 kilometers southeast of Piura City are the ruins of Aypate in the Ayabaca province. That need of expressing feelings and thanking God is something taken to heart in Piura. Most festivities are religious in origin, and take place during holy days. Other traditions include food and dance, two favorite Peruvian pasttimes. The couple who elegantly steps the tondero is a must at every Piuran feast, as this folk dance is the highest expression of joy. The traditional costume for the female dancer is a white or light-colored blouse and a black skirt. Peru's national dance, la marinera, also has many followers in the region; cite Piuran María Martha Reverter, who recently placed first in her category of the National Contest of La Marinera. Piuran cuisine offers a variety of typical dishes such as mashed yucca with fried pork, sweet sugar cane molasses, tamales with the seco de cabrito - tender kid meat with beans - and the fried cachema fish. As for wetting that whistle, the most traditional and popular beverage of Piura is the fermented corn drink, chicha de jora. It is strong, and like beer, an acquired taste for most. The famous carob trees grow and die on Piura's deserted, steppe-like grasslands. Their beans are used to make a frothy mocha-type drink reputed to be an extraordinary tonic called algarrobina. The twisted, medium-sized tree is also Piuran symbol: farm workers tend to hitch their donkeys or horses to its branches before lying down for a snooze in the shade after a hard day's work; the leaves and seed pods are used to feed the goats that abound in the region. The syrup extracted from the carob bean is sold all over the country. The man servants take the maids to the floor waving kerchiefs, while the guitar players strum this celebrated verse that every Peruvian has heard at least once in a lifetime. Piura is a key player in Peruvian history books because of the war hero Miguel Grau Seminario, born on a Piuran oasis. Grau was a senior officer on the Huascar, a warship that took part in the war against Chile in 1879. He kept the invading forces at bay until his death in a battle at sea. The hero is to this day known as Admiral Grau, a rank he earned not only due to his bravery, but also to his kindness and noble character. Grau actually rescued Chilean sailors left in the water after each battle. On May 23, 1879, he wrote a letter to his sister about Captain Arturo Pratt, a Chilean who died during battle. "I have Pratt's sword with its belt and a number of other trifles that I shall send to you at the first opportunity, so that you may give them to his poor widow, who can keep them as a sad reminder of her unfortunate husband. The valiant commander of the Esmeralda died a hero on the ship's deck as he attempted a daring boarding maneuver. I made a supreme effort to save him but sadly too late. His death spoiled the small victory I had won and I spent a day much tormented," lamented Grau. Pratt died instantly after a bullet hit him in the forehead. His widow replied to this missive with a touching letter of thanks. Grau is even known for the letters he penned to the president of Peru seeking supplies for his men, because he had such a way with words. The Huascar is now in Chile, but a scale model can be seen in Piura's Centro Cívico on Tacna Street. In sum, Piura is an exceptional department for its geography, varied enough to produce culinary delights of every food group, despite the blazing sun and overall dry climate. Historically, an important page of every Peruvian student's book is reserved for Admiral Grau, but there are other assets of the region that should not be overlooked. A note from the anthropologist Ana Maria Hoquengheim is in order, given a recent interview conducted by RUMBOS editor Manuel Jesus Orbegozo. Hocquengheim says that Piura is not esteemed as highly as it should be; in fact, she claims it is a forgotten treasure, even by its own inhabitants. The anthropologist singles out seven of 11 ecological features cited by specialists as necessary for a fulfilling and fascinating trip. Here are the seven criteria easily met in Peru, should you wish to grade your next excursion: 1) Warm ocean waves; 2) Tropical forests, such as the Canelo Forest in northern Peru's department of Tumbes which neighbors Piura and borders Ecuador; 3) Chilly ocean waves, which the Humboldt current keeps moving, licking Peru's fine beaches and bringing fish closer to the shores of Mancora, Cabo Blanco or Colan, for example; 4) Pacific desert, such as the interminable Sechura sand, its landscape as inspiring to some as the tropical Amazon jungle or majestic mountaintops of Huaraz (all in Peru); 5) Dry forest, sparsely populated, save the knotty, twisted carob trees and similar resilient vegetation; 6) High jungle, such as that found on the slopes of the Andes, quite accessible to the hiker, despite heights that could intimidate; and 7) Warm plains, where such famous lagunas are found in Peru such as the mystical and supposedly medicinal Las Huaringas waters in Huancabamba and Ayabaca. Hocquengheim maintains that the Piuran map is as unique as the map of a hand: its flora and fauna are unparalleled, with species not found in any other department of the country. Most tourists marvel at this abundance of resources and wildlife, geographic diversity and weather changes. Even the food is deliciously different, so much so that books have been written to capture the tradition of Piuran cuisine. Ana Maria Hocquengheim, director of research for the National Research Center of France, is constantly involved with laborious assignments. Nonetheless, she always makes time to delineate the qualities of Piura for the media, private sector professionals and authorities. She hopes that one day they will do all they can to recognize and effect respect for this incredible region.